Part of what is discussed on this page is preceded by what was presented on the page about tension and compression. There it was explained how the sudden release of pressure or tension in a vortex leads to the creation of a new type of vortex which movement constitutes a rapid fallback to the equilibrium. Such a single movement spans several dimension levels and takes a route over the negative dimensional side of the sequence. I decided to name this process 'inversion'. This is a type of fallback that is not a gradual fallback but a sudden rapid fallback after the movement has jumped to a different cycle in the sequence. Inversion happens quickly. The fallback happens over the negative dimensions, the dimensionality of the vortex suddenly flips from positive dimensional to negative dimensional, and at that same time it also flips from low dimensional (yang) to high dimensional (yin) or from low to high dimensional. This is called inversion, the movement flips over two mirror planes, one is the EM spectrum plane where the electromagnetic spectrum is located, the other is the central balance point of the half-cycle in which the inversion takes place. The movement at one side of the EM spectrum mirror plane is perpendicular to the movement on the other side of the mirror plane. The image above shows the cycles of the sequence illustrated as a spiral. There is a horizontal line and a vertical line going through the center of the image. Both the movement of a sonic boom (in red) and the movement of lightning (in blue) flip over both the horizontal and vertical line after the moment of inversion. After that the movement falls back to the equilibrium, which now is located in a different cycle, 3 half-cycles from the start position of inversion. The image above shows the same phenomenon as in the previous image, but here the cycles are illustrated as a growing sine curve instead of a spiral. In this image the movement that the inversions make is easier to interpret. The image only shows the jump from the moment of inversion to the new cycle at an offset of 3 half-cycles from the start position. You can click on both these images for a larger view. The formula for this inversion of the dimensionality levels is D2 = -(6.0 - D1). For instance, the movement can invert from 0.1 to -5.9 or from 5.9 to -0.1. From that point the movement falls back again to the equilibrium. Lightning was already mentioned on the page about tension and compression as a form of release of tension. On the page about tension and compression I explained how a lack of a sufficient number of meridians (individual movements) within a high dimensional vortex can lead to a buildup of tension within that vortex. When that tension exceeds a certain limit a sudden release is evoked in the form of lightning. This is one form of inversion, after which the movement falls back to the equilibrium. Lightning is a negative dimensional vortex type. We know that it is negative dimensional because it consists of plasma. All plasma, whether it is hot or cold plasma, is negative dimensional. We know how the visible shape of a lightning streak looks like. Besides this, there is more that we can say about the structure of lightning. Fulgurites (from the Latin fulgur meaning thunderbolt) are natural hollow glass tubes formed in the ground by lightning strikes. They are formed when lightning with a temperature of at least 1,800 °C (3,270 °F) instantaneously melts silica on a conductive surface and fuses grains together. The fulgurite tube is the cooled product. This process occurs over a period of around one second, and leaves evidence of the lightning path and its dispersion over the surface. Their color varies depending on the composition of the sand they formed in, ranging from black or tan to green or a translucent white. They are sometimes referred to as petrified lightning. The glass formed is called lechatelierite which may also be formed by meteorite impact and volcanic explosions. The tubes can be up to several centimeters in diameter, and meters long. They are root-like in appearance and often show branching or small holes [text from Wikipedia]. The interesting thing about these fulgurites is that it looks like they are formed by the path of the lightning. They look like streaks of lightning burned into the ground. And these fulgurites are hollow, which suggests that the paths of lightning could in fact be hollow as well. It is not something we would expect when looking at either natural or man-made lightning. It is not possible for us to see. We would not expect the streaks to be hollow but these fulgurites suggest to us that they might possibly be hollow. Fulgurites are formed by lower atmospheric lightning. Lightning also occurs higher up in the atmosphere. At higher altitudes lightning looks different, that is because it is formed by a different vortex type, a different level of inversion. The inversion for lightning constitutes a jump from the positive to the negative dimensions, the dimensionality of the vortex suddenly flips from positive dimensional to negative dimensional, and at that same time it also flips from low dimensional (yang) to high dimensional (yin). This is due to a sudden release of tension. Inversion starts at the end of the first upper half-cycle, and ends up at the end of the third lower half-cycle. The vortex that appears directly after the inversion is called the fallback vortex. In the case of lightning, the fallback vortex is the visible lightning that forms in the atmosphere. The image above shows for several high dimensional vortices in the sequence the fallback vortex that occurs when instantaneous inversion happens at the dimension level of that particular vortex. It is not sure if the above image shows these relations completely correct, but it is somewhere close to this. It is also worth to mention that lower atmospheric lightning, or the type of electrical discharge that is similar to lower atmospheric lightning here on earth, does not occur in outer space. So far I have not found any observation of such phenomenon. The revolute is a vortex that can not appear in space because the revolute is the state of equilibrium of the outer space medium. But it is also true that one of the antipodes of the revolute, which is in this case a negative dimensional antipode, does not appear in space either. It could be true that this is a general rule that applies to all the antipodes of any state of equilibrium of any substance. One of the fallback vortices that was already identified on the page about tension and compression is the vapor cone that can be seen when an airplane makes a sonic boom. The vapor cone is the result of a release of compressive force. The tip of the vapor cone, the start of the vortex, is where dimensionality is almost -6.0D. The vortex itself spans half a dimension level from -6.0D to -5.75D. This is because the vortex is the inversion of the hyperkone, which spans from 0.0D to 0.25D within the first half-cycle. Dimensionality not only flips from positive to negative, it also flips from low dimensional to high dimensional. If the sudden inversion starts at 0.25D for example, the dimensionality level will flip to -5.75D. Why this sudden release of compressive force takes place, the factor that determines why a certain limit is the maximum allowed force, is not known. The compression rises because the amount of abundant meridians keeps rising. The acceleration of the airplane makes the induced vortex movement of the airplane lower and lower dimensional. But the number of meridians stays the same. Thus what happens is that contraction takes place without decrease in number of meridians, which leads to compression. It could be that the moment that the inversion initiates is the moment that multiple meridians intersect one another, because they are packed too close to each other. Under normal circumstances, the meridians never touch one another, but are in most cases inter-weaved in braided patterns which for high dimensional vortices can be quite complex. Yet, this theory does not explain why the opposite reactive force can occur. It does not explain the sudden release of tension that takes place with lightning. In that situation the meridians move too much apart from one another, and there does not seem to be a way to tell at what moment the force of tension is too great to withhold the inversion from taking place. If we carefully observe many different still photographs of vapor cones then it comes to the attention that these cones are not all the exact same shape. There are at least three basic types of shapes, and any morphology in between these three types is possible. The type of vortex that forms depends on how close the movement got to the zero point. The closer to the zero point, the more outward moving the reactive vortex is (thus higher dimensional). The further away from the zero point, the less outward moving the reactive vortex is (thus lower dimensional). The image below shows these three basic types. The level 2 and level 3 fallback vortices are hollow vortices. The level 1 fallback I'm not sure about. It could be hollow but there are some observations that suggest otherwise. We need to look at more images of sonic booms to be sure. What I also don't know is how much further away from the zero point the inversion takes place that creates a level 2 or level 3 fallback vortex. Thus at what dimensionality does the release of compression start for those less tighter vortices? It could be that the level 1 fallback starts between 0.0D and 0.25D (thus the level of the hyperkone), level 2 fallback starts between 0.25D and 0.75D (thus the level of the spire) and that the level 3 fallback starts between 1.25D and 0.75D (thus the level of the helicone). The length of the vortex depends on the medium in which it exists. In air, within the earth's atmosphere at low to medium altitude we only see the first part of these vortices. At higher altitudes or in outer space these vortices become longer because the equilibrium becomes higher. In air the equilibrium is the center of the bulb, thus at 3.0D. In outer space the equilibrium is the center of the revolute (at the macrocyclic level), thus at 4.0D. The fallback in outer space thus is greater. That is why in outer space these vortices have a longer tail. Below are two examples of a level 1 fallback, and two examples of a level 2 fallback. Instantaneous release of compression is something not only observed here on earth, but also in outer space. Protoplanetary nebula are fine examples of such release of compression. These nebula have a star in its center. And a star is always formed around a zero point. You can easily see in those images that the vortex is negative dimensional. This is because the images show a series of bright colors. Vapor cones are thus almost the same thing as these protoplanetary nebula. They are the exact same vortices except at a bigger scale level and one is the result of a fallback from a single spire (or another very low dimensional vortex), the other is the result of a fallback from two opposing spires, one at each side of the zero point. Not all protoplanetary nebula fall into these three categories. There are other types that still need to be classified. There are two things to be learned from the photo of level 2 fallback on the space rocket. One is that you can clearly see that the vortex is hollow. The second thing is that the vortex is longer than the level 2 vapor cones produced by most airplanes. The reason for this is that the rocket is cruising at a higher altitude, at higher altitudes the air is higher dimensional, thus the equilibrium of the medium is located at a higher point in the sequence, further away from the starting position of the fallback. Above is a photo of planetary nebula M2-9. This nebula shows two levels simultaneously. The fallback vortices are quite long, which is something we also observe in other protoplanetary nebula. On earth, these vortices are never this long. You can see that at the ends the vortices fade into the invisible, they end in the void of outer space. The reason that it appears to fade out and end into the invisible is because those ends connect to the medium around it. The ends of these fallback vortices have the same dimensionality of the outer space medium. So it is there that these vortices end and the outer space medium starts. It only appears to be a dead end, but it is not, these are all connections. A fallback can be preceded by a spire. In most cases we do not see a spire. This is because a spire only has a core movement, it has no periphery thus it can not be seen with the naked eye. Only when the spire is a highmorph spire and thus partially morphed into a helicone then it becomes visible. It the case of the vapor cone it is the airplane that induces the effect of a spire because the airplane makes the same movement of a spire, which is simply a single accelerating movement in a straight line. In space we can not see these spires in most cases just as we can not see them here on earth in most cases, but there are exceptions. Below left is a Hubble image of a protoplanetary disk. It consists of two fallback vortices with two spires. These spires thus are visible because they are highmorph spires (if you still don't know what 'highmorph' and 'lowmorph' means, read the page about morphing and shifting). At the right I added an image of a land tornado, which vortex type is a helicone. I found the similarity between these two images to be quite remarkable. The spire in the left image is a highmorph spire, thus partially morphed into a helicone. The helicone in the right image has also what looks like a fallback vortex at its tip. As a matter of fact, many land tornadoes have such a dust cap at their tip. I am not sure if there is a relation between these two images, because the dust cap seen with the tornado does not behave like a fallback vortex. Its movement is slow and it rotates in one direction. The similarity could be coincidental. But both the spire and the helicone are ladders from the same half-cycle, and the shape of the vortex at the low end of those ladders looks closely identical. It could be that the vortex at the low end of the ladders is a level 2 fallback in the left image, and a level 3 fallback in the right image. One of the observed effects of all the low-atmosphere fallback vortices here on earth is that all of them produce a loud sound. Low atmospheric lightning and sonic booms can be heard from miles away. Immediately you should be asking yourself why this is so. Well, the answer can be found in the route that the movement performs. Lets for example look at sonic booms. On the page about sound we revealed that the center of the audible sound region for humans lies somewhere around the bulb, thus at 3.0D. A sonic boom is the result of a rapid movement from the start of the first half-cycle to the start of the fourth half-cycle. During this inversion the movement passes two central balance points, one central balance point of the first half-cycle (the position of the bulb), the second is the central balance point of the third half-cycle (the position of the vessel). For this reason a sonic boom makes two loud booming noises closely in succession. A so-called double boom, which almost sounds like a single boom. The interesting thing is that we humans can create this type of vortex movement ourselves, and build intruments that utilizes this type of vortex movement to produce loud sound. And we have been doing this for centuries without anyone actually realizing from what vortex movement it originates from. The image below shows a few of such instruments. All these human inventions produce loud sound. The higher the level of the fallback the more gentle the sound. The lower the level of fallback the more crude the sound. These devices all operate by hitting it with a rigid object, it is the metal body of these devices into which the vortex movement takes place. The shape of the device determines the type of vortex. What these devices reveal to us is that the level 2 and level 3 fallback vortices are indeed hollow and the level 1 fallback might be hollow as well. If these three types of fallback vortices produce audible sound, then logic tells us that these vortices must also produce infrasound. This is because the first part of the vortex is low dimensional, its movement crosses the region of infrasound. We know this is true with sonic booms, sonic booms are sources of infrasound. So then these devices should also produce infrasound (but still not completely sure because these vortices are negative dimensional, not positive dimensional). 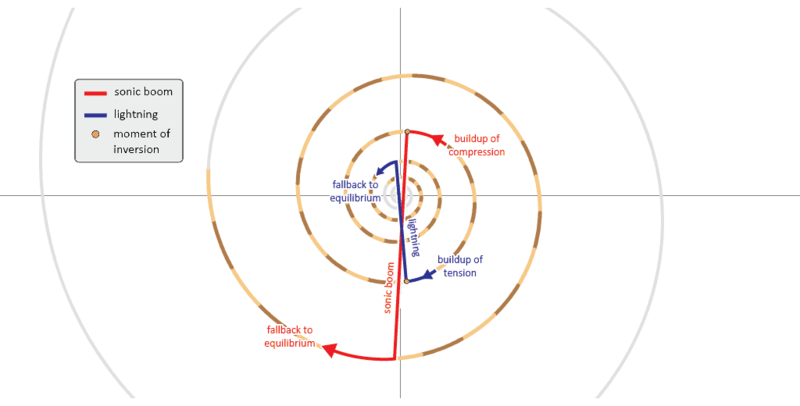 The level 1 fallback vortex is the fallback vortex of which the starting point of the movement is closest to the zero point. The closer the movement starts from the zero point, the steeper is the cone. When the starting point is very close to the zero point, the shape of the vortex almost looks like a flat pancake. Three of such examples are shown below. All the examples of fallback vortices we discussed so far are of release of tension or compression that occurs when the movement falls back after an inversion that took place before reaching the EM crossing location. Thus these inversions take place above the zero point or below the infinity ring. But what happens when inversion happens beyond these EM crossing locations, thus within the negative dimensions? One of these two is not that hard to figure out. We know that light is the vortex that lies exactly on the zero point. Light casts its rays evenly in all directions. The movement is outward spherical. For the sun's corona this is almost the same. The corona is more chaotic, its rays do not cast perfectly in all directions and do not stretch out to infinity, but the movement of the corona still is very much outward and in all directions. So what would we expect when inversion would happen beyond the zero point? If inversion truly is possible beyond the zero point, and if that sudden release will also produce a fallback vortex, then how will such a vortex look like? We know that the vortex we most frequently see with explosions is the pylon (or the pilaster), connected to a revolute. This vortex forms a mushroom cloud. The pylon is the vortex that is located one dimension above the equilibrium, thus above the location of the bulb. But that is not the first vortex that forms when the explosive ignites. If we look an an explosion in slow-motion, then we see something else, something that comes before the revolute. Take a look at these three images below. These three images are all three captured at the moment of a nuclear detonation. It shows a spherical vortex that rapidly expands. It expands so fast that we can not see it in real-time. As it expands in all directions it quickly fades out. It is only after this vortex that the revolute forms. These three spherical vortices are fallback vortices, only difference as to compared with the other examples is that here the inversion happens beyond the zero point, thus within the negative dimensions, and thus probably makes a jump to the positive dimensions. The spherical vortex could be the start of the shockwave, which is a spherical outward moving vortex. The path that this type of movement makes must also be different from the other two examples. The exact route that this movement takes is not yet known. So beyond the three levels that we discussed so far there are other levels. The fallback vortices that are part of these levels are spherical, and grow away from the zero point in all directions. The first vortex that comes after the zero point I call level -1. I do not know if it is possible for inversion to happen exactly on the zero point, or what the effect or resulting phenomenon of that would be. Explosions also occur in space. A well known type of explosion in outer space are supernovas. A supernova is an exploding star. Here too the first vortex that appears is a spherical fallback vortex. The images below shows three such examples. Each of these three spheres look very different. We know that the fallback vortices that start before the zero point are negative dimensional. Dimensionality thus suddenly flips from positive to negative before the fallback vortices form. So now we want to know if the dimensionality also flips when inversion happens beyond the zero point. Does dimensionality temporarily turn positive? These supernova images give us the answer. These spheres show a number of bright colors, which is a strong characteristic of negative dimensional vortices. These fallback vortices are thus negative dimensional, just like the fallback vortices that form before the zero point. Thus the answer is no, dimensionality does not flip to positive. Another way we can find the answer is because we know these balls are made of plasma, and plasma is negative dimensional matter. Image by NASA/CXC/ Rutgers/ J.Warren & J.Hughes et al. If there are different levels of fallback before the zero point, then there's a good chance that there are also different levels of fallback beyond the zero point. The level 1, level 2 and level 3 fallbacks could have a level -1, level -2 and level -3 equivalent. Problem is that all these negative dimensional fallbacks are spherical, so it will be harder for us to identify these different types. The three images of supernovas above could all be different types, just as there are many different types of orb vortices. Now that we know enough to define lightning and sonic booms, we also know enough to define an explosion. What comes directly after these spherical fallback vortices is the vortex that is located one dimension above the equilibrium. In air this is the pylon or pilaster, then followed by the revolute or revodome. It is the familiar mushroom cloud that we see with large explosions, although smaller explosions often form a mushroom cloud as well. This revolute vortex is what comes after the fallback vortex, because that movement ends at the equilibrium. If in air an explosion produces a pylon with revolute as a secondary vortex, then logic tells us that in outer space, this second vortex should not be a revolute, but a belt or gyroduct. The reason for this is that the equilibrium of the outer space medium (at the macrocyclic level) is located two dimension levels higher than in air. And as in some explosions in air both the first subsequent vortex (pylon or pilaster) and the second subsequent vortex appears (revolute or revodome), so does with some explosions in space also two subsequent vortices appear. These are the venus belt, laminar belt or gyroduct, followed by the scroll ring or tubular ring. The image above shows the positions of the vortices as they appear in an explosion in space. The reason it is known that the vortices are positioned in that way is because of the telescope image of supernova 1987A. The light ball you see in the center of the image is the source of the explosion. The orange ring around it is most likely a gyroduct. The two larger darker rings could be tubular rings. A gyroduct normally only appears together with a revolute, because a tunnel does not appear alone but always attached to one or two spirals. But a revolute can not be visible in outer space because the revolute is the state of equilibrium for the outer space medium (at the macrocyclic level). Thus here the gyroduct is able to appear without a revolute attached around it. I do not know why the tubular rings appear outside the gyroduct instead of inside. They also have a bigger radius than the gyroduct. It is the same situation in that I do not know why in some nuclear detonations condensation rings (which are belts) form which always appear outside the head of the mushroom cloud (which is a revolute) instead of inside. Their size also differs from the expected radius. According to the sequence, those vortices are supposed to form inside the preceding vortices, and are supposed to be smaller in volume. The reason for this could be found in the morph sequence, where the next vortex should always be larger than the previous vortex. In large explosions the observed movement of these belts is not a flow movement but a morphing movement. The belts are morphing into the next vortex in the sequence. Therefore it could very well be that in supernova explosions the tubular rings or scroll rings are also morphing. So an explosion in air produces a pylon and revolute vortex as secondary vortices. An explosion in space produces a gyroduct and two tube rings as secondary vortices. If this pattern is correct than we can predict what the secondary vortices are when an explosion ignites in other mediums. All we need to do is look at what the state of equilibrium is for a medium and determine what the type of the vortex is that is one dimension level higher than that. That is the vortex that appears in the medium when an explosion takes place. Below are some of the varieties of explosions in several different mediums illustrated in one image. There are still two observations missing in the examples above (which are replaced by an image of a puzzle piece). We need to observe the effect of explosions in earth and gypsum to determine if there really is such a thing as a helical movement or swirl movement in those phenomena. There is one possible clue for the vortex movement of the underground explosion. Some underground explosions give an implosion effect, said to be caused by the oxygen in the ground being consumed by the explosion. There is a possibility that this conclusion of the cause of the implosion is not correct. The swirl should be a vortex movement that is created by some explosions beneath the ground, and the swirl is a vortex that under all observed circumstances so far always makes an inward movement (although it is expected that al least one arm of a swirl can also make an outward movement when connected with an inner bridge with the other arm). This inward movement of the swirl could be what causes the implosion beneath the ground. So the primary vortex that comes with an explosion is a spherical fallback vortex. The secondary vortex is a positive dimensional vortex one dimension higher than the equilibrium. A question that remains is: what happens when inversion takes place beyond the end of the first half-cycle? What happens when sudden release of tension takes place beyond the infinity ring? That is one of the mysteries that still remains to be solved. But I can tell you this: it is probably another phenomenon which we are already familiar with, but of which we will only then know its meaning in relation to the transformation sequence.